The adage ‘When in Rome, do as the Romans do’ is clearly the way to immerse in the local culture of a foreign land in a jiffy. Whether you are exploring a new country or residing in one as a permanent resident, it is always good (and fun) to learn the ways of the locals while you are there. One of the most effortless ways to start is to pick up the local’s lingo for the ordering of food and drinks at their local coffee shop. In Singapore, the local coffee shops are affectionately referred to as Kopitiam, has an interesting list of drink names. 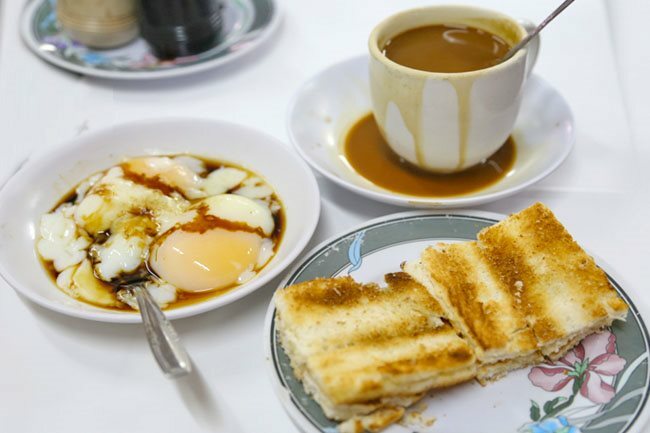 The term ‘Kopitiam’ is actually derived from the Hokkien dialect, a language that is commonly used by the Chinese in Singapore. Hence it is no surprise (as you would probably have guessed) that some of the names in the drinks list showcase the influence of Hokkien and other different but common languages in Singapore. Without further ado, let’s dive right into a guide of the different and interesting drink names that has a touch of pop culture influence too! Tak Kiu translates to “kicking a ball”. This Hokkien name was given to this chocolate malt drink as the packaging of Milo products are usually stamped with a footballer kicking the ball. Thus the literal name. To order an iced version of this drink, simply add “peng” after saying the drink’s name. This applies to all other drinks that you are ordering at the local coffee shop. Peng ( pronounced as ‘ pi-eng’) is the Hokkien pronunciation for ice. The name for this drink is derived from an advertisement by Horlicks. The commercial advertisement features a group of kids singing along to a jingle that went “…ho-ho-ho..”. The jingle was so catchy and had many singing it, it seemed like everyone was ho-ho-ing. This thus brings us to what ‘Tai Ga Ho’ means. It means ‘Hello everybody’ in the Cantonese dialect. But in this drink’s case, it probably is a Singaporean-English way of translating with the mish-mashing of Cantonese and English —Tai Ga ( Everybody in Cantonese) and Ho (as the ho-ho-ho part as mentioned earlier). Give this malt drink a try when you are in Singapore and ask for the ‘gao kosong’ version of it. ‘Gao kosong’ means ‘concentrated and without additional milk or sugar. In Hokkien for the former and Malay in the latter word.‘Gao kosong’ can be said after other drinks that you can customise at the drink stall, like coffee and tea. Chinese tea is usually steeped in hot water with the leaves in a tea bag when you order it at the Kopitiam. To quicken the brewing process, the string attached to the tea bag is tug and released to help the water to infiltrate the leaves. This action resembles that of fishing and hence the Hokkien term ‘Tiao He’, which means fishing. Should you ever find yourself needing the tea to be warm instead of boiling hot, the local term would be ‘ban shao’, which translates directly to ‘half hot’ aka warm in mandarin. Why? Simply because the star was black and then went under the knife to be white. So being an embodiment of both black and white, just like the drink of grass jelly and soybean milk, the name of this mixed drink is born. Do note that this drink is usually found at a separate stall that sells soybean and grass jelly instead. Clementi is the name of a neighbourhood and MRT Station in Singapore. It rhymes with lemon tea and thus the local twist to the beverage’s name. ‘Huey’ means flower in Hokkien. Ah Huey in a different context can be a young lady’s name or a term that is used as a teen female gangster in the local context. With Chrysanthemum being a flower, it is only apt that the local spin given to it in the name of fun is ‘Ah Huey’. If you would like to get the hot or warm Chrysanthemum tea, be sure to say “Ah Huey Shio”. If not, a canned version of the tea would be given to you instead. With these nouns and suffix, all you have to do is string them together with the mentioned format and you are good to go. For example, an order of coffee, iced, less sugar to take-away, you can say, ‘Kopi Peng, Siew Dai, Dapao.’ Easy!